Apple season is upon us, which means we can’t wait to dive taste buds first into all the fall-flavored goodness. Whether you go in a savory or sweet direction, apples are THE most essential autumn fruit you need in your life right now (pumpkin lovers, don’t @ us … just make these instead). So, first things first, a word about your apples: we like Granny Smith and Honeycrisp, both for their ability to stay somewhat firm even after prolonged heat exposure. Because applesauce is great and all, but we’re looking for a fruit that will maintain a little texture and crunch, especially when cooked. Now, on to the fun stuff. Apples can go one of two ways — savory or sweet. Sweet is the obvious choice (and we’ll get there! ), but savory is a surprising party for your mouth. Celebrate seasonal vegetables with this apple, beet and potato tart, the kind of side dish that will impress your foodiest of foodie friends. Need a wow of an entrée? Whip up this pork chop and apple roll-up. Caramelized onions, fresh sage and sharp white cheddar meld to create a flaky bite … plus an easy Sunday night supper. And if you’re looking for a bite of the unexpected, it’s hard to go wrong with these apple, goat cheese and pesto mini tarts. Elegant yet easy, they’re an A++ party app. If you’re looking to enhance the natural sweetness of your fall apples, get cracking on dessert. 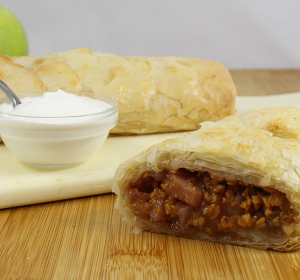 It’s hard to go wrong with a quick apple strudel or pear and apple phyllo crisp. With a cup of coffee and a zap in the microwave, these leftovers make a splendid, sorta kinda healthy breakfast (there’s fruit, ok? and phyllo is low-fat). 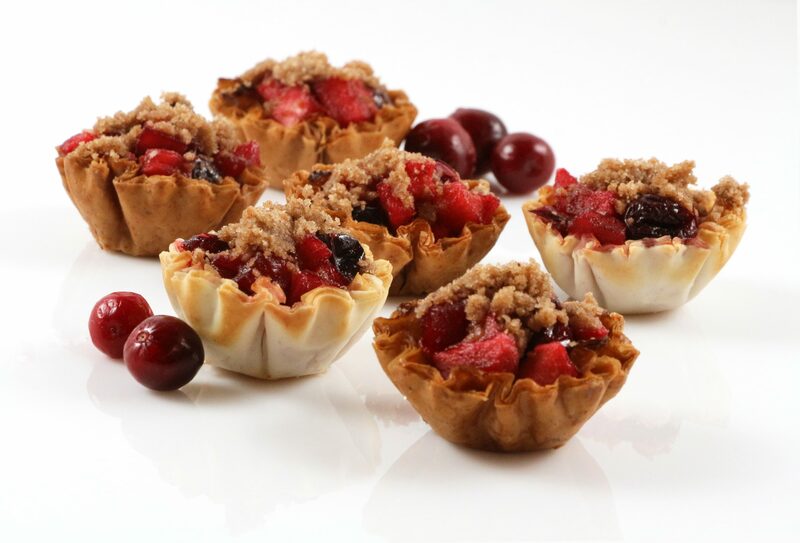 We also love a miniature sweet treat — and these cranapple crisps totally fit the bill. A little sweet, a little tart, fresh cranberries tangle with cinnamon and orange zest for a decidedly grown-up snack. For a sweeter but still seasonal tartlet, you can’t go wrong with the taste of these mulled cider mini cheesecakes. Try these recipes with our graham or chocolate flavored shells for an extra boost of fall flavor. 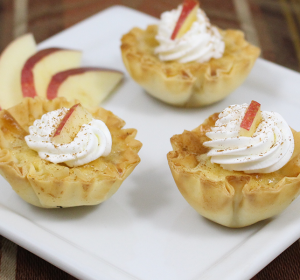 No matter which direction you go, just know that there’s no better match than apples + flaky phyllo! For even more inspiration, check out our Fall Favorites Pinterest board.